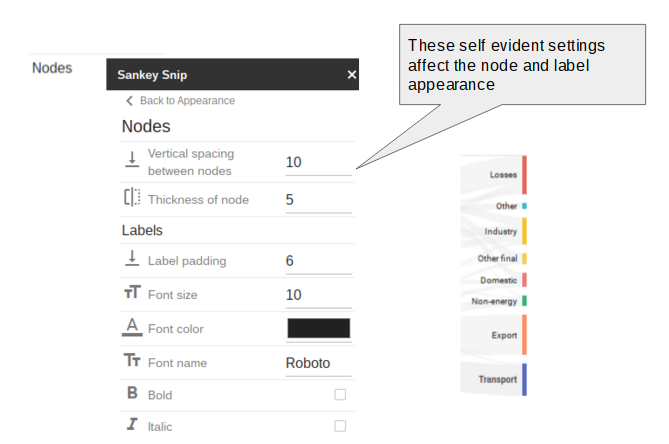 Sankey snip is an add-on for Google Sheets that creates a Sankey flow diagram as you type, gives you the SVG code to embed it in a web site and the ability to embed it in your Sheet. It’s available on the Sheets add-on store. I’ll use the Google Charts Sankey variant (which is actually also based on D3 under the hood). 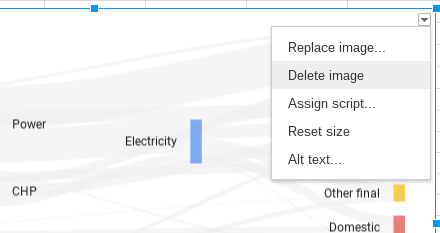 On initialization, Sankey Snip automatically identifies the data on the active sheet and builds a Sankey diagram. 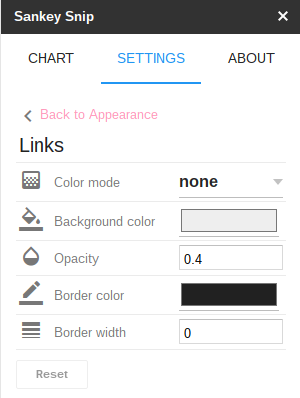 The sidebar looks like this and shows a preview of the chart you can choose to insert into your sheet. But here’s a quick explanation for those unfamiliar with Sankey charts. 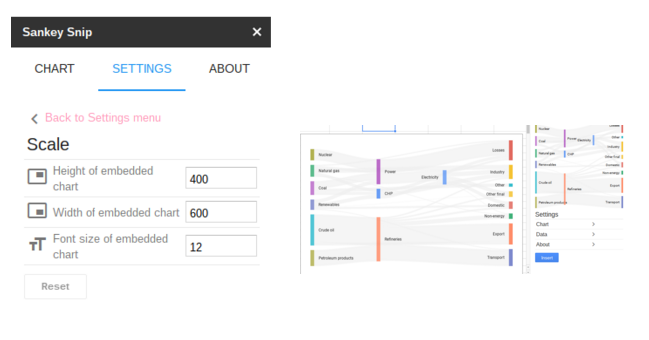 Sankey Snip is a Google Sheets add-on which maintains a sankey chart preview in the sidebar of the active sheet’s data in real time. Sankey charts are often used to show transformations in a system (for example energy sources and uses), or material or money flows between a co-operating group. Google Analytics uses this kind of diagram to report on site navigation behavior. 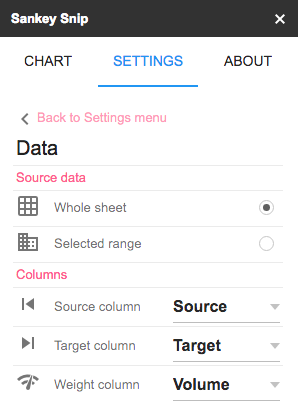 A Sankey chart needs 3 data items, which should be laid out as columns with headers in a sheet. By default, the source data will be automatically detected in the active sheet, but you can customize the column names and range via the Data Settings. 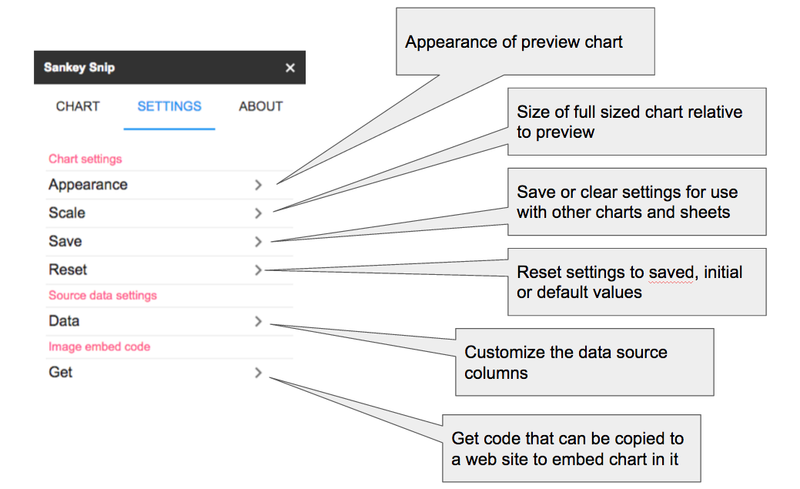 Any changes you make to the data will automatically be reflected in the chart preview. 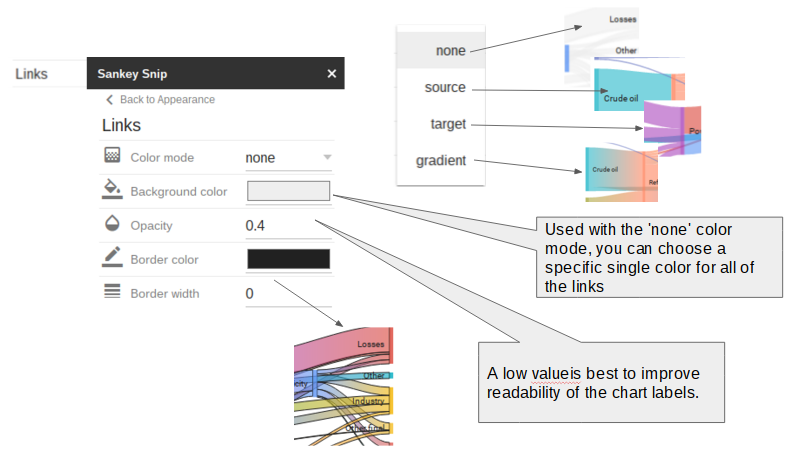 Google Charts are used for visualization. Information about settings and options can be found here. 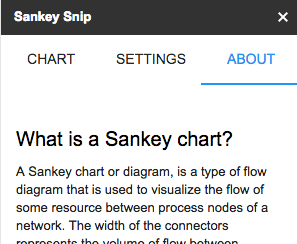 There is no need for any action to incorporate data changes in the chart preview, since Sankey snip automatically detects active data and updates the preview in real time. It also detects if you switch to another sheet and will attempt to create a chart from whichever sheet is currently active. 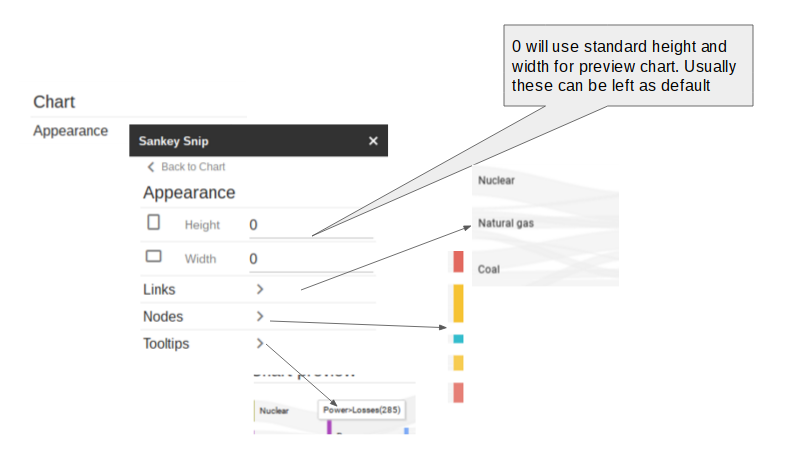 There are 3 columns of interest for a Sankey diagram. 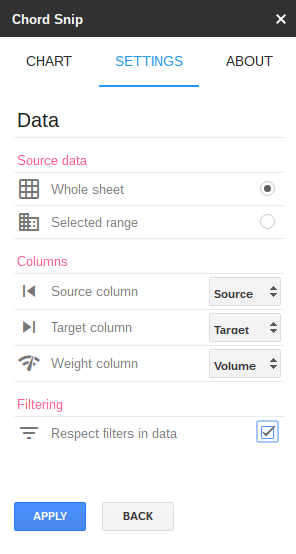 Sankey snip will try to deduce which columns are which, but you can explicitly set them via the Data settings dialog. The columns section can be used to modify the source data location. 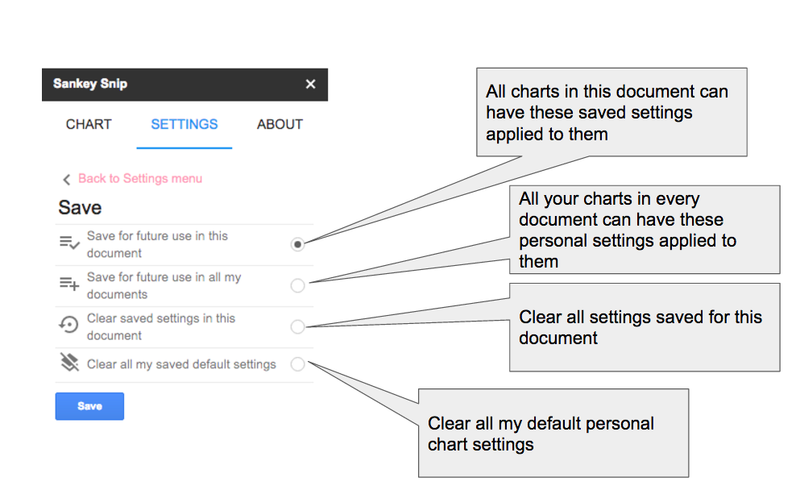 There are a large number of settings available to change the appearance of both the preview and full sized chart. Let’s take a look through them. It should be evident from the images what each setting does. Each from and to item in the data results in a node. The links show the flow between the nodes, and the nodes are labelled up using the data from the sheet. The appearance and spacing of nodes and labels can be adjusted in the nodes dialog. When you hover over the preview chart, tooltips show summary information about the source data for the link. These settings set the typography appearance. 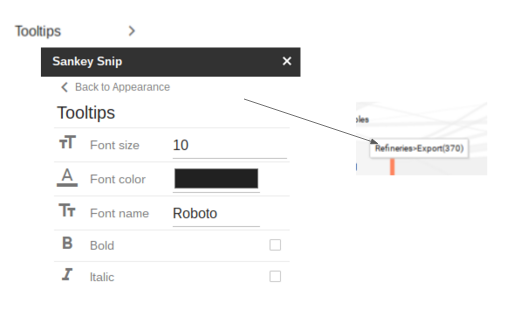 Tooltips are only available in the preview chart, since an inserted chart is simply a scaled image. 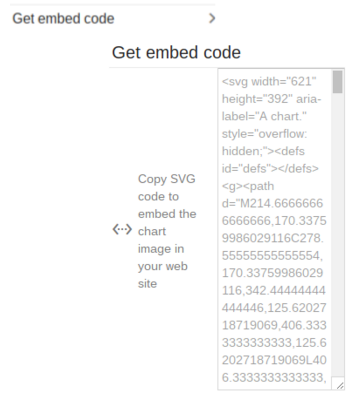 Sankey snip creates SVG code that can be copied directly into a web page’s HTML code to embed the chart. Just copy the code in this dialog. You’ll notice that each settings page has a reset button. This allows you to undo any changes you’ve made while on this settings page. It will be enabled if you have made any. 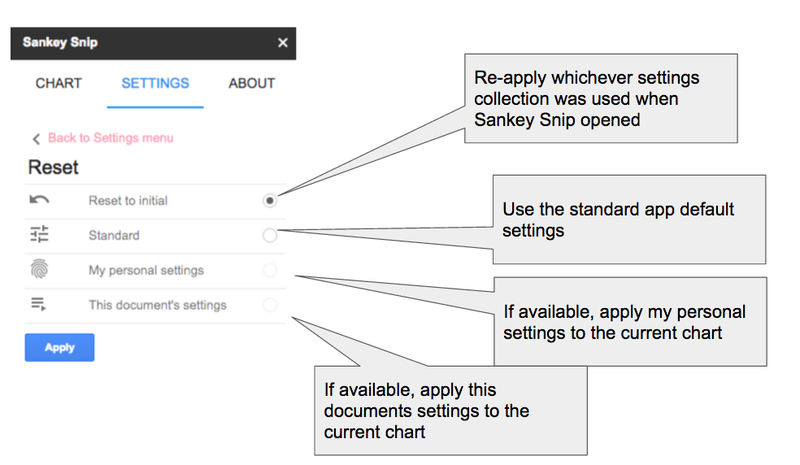 In addition, Sankey snip has a comprehensive way of making settings permanent so you can re-use them if you have a house or document style you want to follow, or for restoring complete settings as they were at the beginning of the session, or to the default values for the chart. This dialog allows you to retain the current settings so that they will apply each time you open this document, or to every document where you use Sankey Snip. Clear these settings will cause Sankey snip to revert to it’s normal default values in this and other documents. Sankey snip follows this pattern when deciding which settings to use when opening, using the first settings collection that exists. The add-on now uses SheetsMore to respect data, so the chart will pay attention to the most common types of filters selected in the UI. Since this is a service with a quota, the setting of respect filters is not saved to avoid unnecessary API traffic, so if you want it, you need to set it for your session. This behavior is set in the Data Settings. This add-on is now available in the Sheets Add-on store.